Once upon a time, when I was working at Starbucks, I met a new coworker. His name was Matt and he really liked food. During the shifts we shared, we would talk about restaurants downtown in Toronto. We would dream of one day finally taking the three-or-so modes of public transportation to get to these places, but nothing ever really panned out. 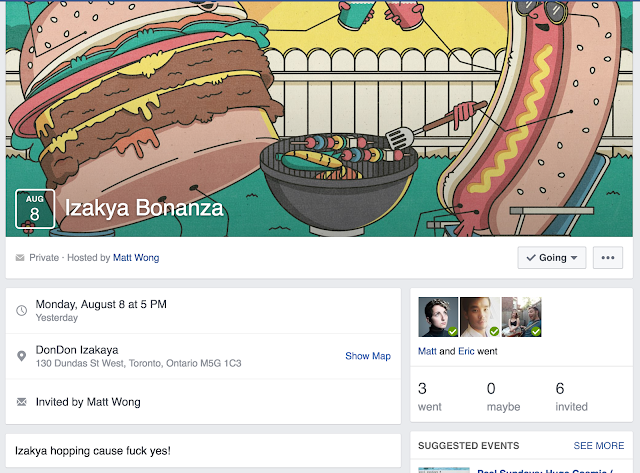 Then, a few months ago, Matt invited me to a very strange Facebook event. It was to be a Duck Hunt. As I read over the details, I realized that we would be restaurant-hopping in Chinatown in search of the best Peking Duck in the city. This is the truly revolutionary idea – get five to ten people together and order enough for a full dinner for two people at each restaurant. But the end of the night, everyone is full, and everyone has experienced a LOT of restaurants in the city. 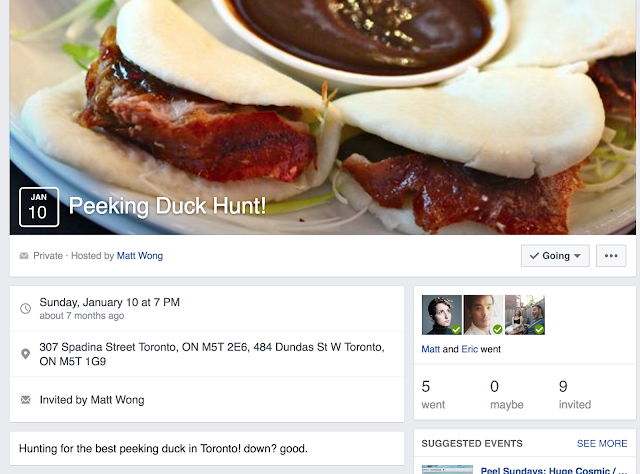 It's kind of like speed-dating, but for culinary exploration. Eric and I only made it to two out of the five total restaurants (amateurs) but we had some DELICIOUS food. I have since been back to both of those restaurants. For your knowledge, I personally went to House of Gourmet (amazing Turnip Cakes) and People's Eatery (which should be a whole blog post in itself - everything was INCREDIBLE). Fast forward to the present day. We all wanted to try something else out, so Matt suggested we do an Izakaya hop! I am not a huge fan of raw fish, but I want to try new things, so I prepared myself for an interesting night of food. An izakaya (居酒屋?) (Japanese: [izakaja], ee-zah-ka-yah) is a type of informal Japanese gastropub. They are casual places for after-work drinking. They have been compared to Irish pubs and early American saloons and taverns. Which is exactly as I would describe it. They generally include long wooden tables and benches that are communal (yes, we did some people watching including what appeared to be a very awkward first date) and feel like the Japanese version of a pub. Each one had different interesting snack foods and even stranger drinks (including the beer slushies I've been hearing about forever). This place was decked out to the max. Japanese scrolls all over the brick-and-wood slab walls, and even some little kneeling tables in their own booths for bigger parties. I got a sake slushie (only $4 on Tuesday special) and we shared a few dishes. There was a bowl of rice with chunks of raw fish, beef tataki, and a sizzling plate of fatty pork. Delicious. Also, there was a huge drum at the entrance and every time someone entered or left (us included), they would bang the drum and yell. That's the part about Izakayas that I didn't mention before. Lots of that. The sakura flower is a sugar cookie with something very salty in the middle - not sure what that is. The white ball is mochi and the orange one is a whole chestnut. Deep down in the layers is red bean paste (my favourite) and some nutty rice crisps. The rice crisps were at the bottom so that they would soften down as the ice cream melted. It's great. I had been to this restaurant's sister location on Bloor (formerly Guu) and had enjoyed the food, but the atmosphere was a bit dark and dingy. This location is beautiful and well-lit inside, with interesting woodwork and a lovely patio on a sleepy street. Even though it's a bit farther, I'd definitely come to this location over the closer one. We really went all in on this one, ordering eggplant and zucchini in a miso sauce, chocolate creme brûlée, and tempura squid/fish cakes. Delicious. And on top of that, I ordered a Peach mojito to go along with our pitcher of Sapporo and a plentiful order of sake inside a bamboo pitcher! With bamboo cups! So cute. I noticed that all of the staff was yelling at people in Japanese as they left, so when we were leaving, I turned and yelled "Bye, Everybody!" I was very amused when everyone shouted back at me. It was quite a time. There were actually three more restaurants on the journey, but as last time, I am only one human and had to cut my night short there. But I learned that Izakayas are just generally really nice places to go for a drink and a snack, and have a really friendly atmosphere. Next time, I'm going to plan the restaurant hop and it's going to be Korean food. My favourite!